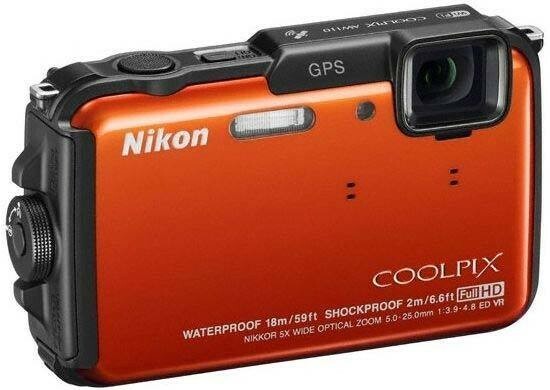 Listed below are some of the rivals of the Nikon Coolpix AW110. The Ricoh PX is an unassuming compact camera that is a lot tougher than it looks, being waterproof to 3m and shockproof to 1.5m. Ricoh's first entry into the all-action market also offers a 16 megapixel sensor, 5x zoom lens and 720 p video. Can the Ricoh PX take on the likes of the Olympus Tough range? Find out in our detailed Ricoh PX review. The WP10 / AQ100 is Samsung's first foray into the world of waterproof cameras. Sporting a 12 megapixel sensor and 5x zoom lens, the WP10 can be used at a depth of 3 meters / 10 feet. Available for less than £179.99 / $199.99, read our Samsung WP10 review find out if this budget shooter is all the camera you need. The Sony Cyber-shot DSC-TX20 is a small and stylish camera that's freeze, shock, water and dust proof. The Sony TX20 has a 16.2 megapixel back-illuminated Exmor-R sensor, 10fps burst mode, 3 inch touch-sensitive LCD screen, a 4x zoom lens and full 1080i HD movies. Read our Sony Cyber-shot DSC-TX20 review to find out if it's worth the £280 / $330 asking price.